This Week's TV: It's Sharktopus Vs. Pteracuda Vs. A Second Sharknado! While the world prepares for the onslaught of a second Sharknado movie, Conan O'Brien is about to die at the tentacles of a new Sharktopus. Plus, Gravity Falls is back for more paranormal hijinks and The Strain gets its hands bloody with a vampire autopsy. See all the details below! Syfy has declared this Sharknado Week, with a full slate of shark monster programming. Head over to Syfy for the complete Sharknado Week schedule. You mean that the plan to infect the whole town with a potentially deadly virus wasn't universally acclaimed? Still itching for more Comic-Con commentary? Wil breaks down all of the madness in this week's show. 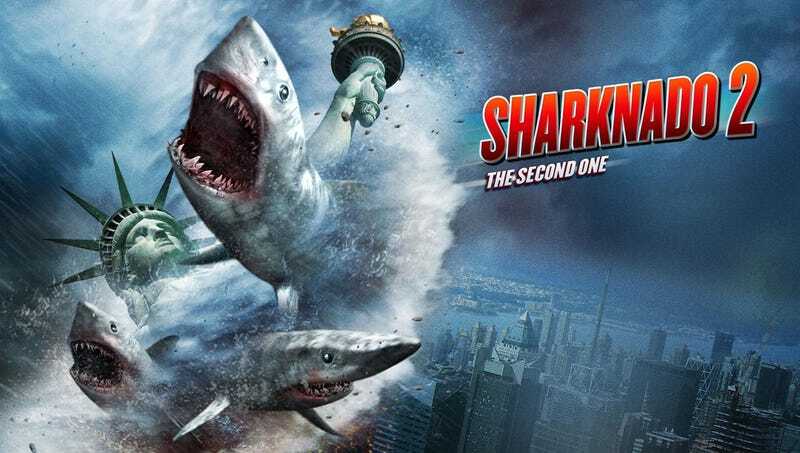 Another Sharknado is coming at your TV set like, well, a swirling storm of hungry sharks. Miss this television movie at your peril. How else are you going to learn how to avoid flying sharks? When The Brain captures the Titans to fuel Project B.R.I.A.N., the Titan's little buddies are the only heroes who can save them. Don't call LSP a grapefruit unless you want your pancakes tagged. It's Princess Day in Ooo! You know that that means? Yep, LSP and Marceline team up to prank Breakfast Princess! Datak is framed for a bizarre murder, while Irisa learns more about her true destiny. Alex is called upon by Michael to help prevent any further casualties after innocent higher angels turn up dead in Vega; at the same time, Gabriel causes tension by revealing a long-hidden secret; William "re-educates" his father; and Noma reignites an old flame. Many cars were harmed in the making of this episode. The MythBusters test three car crimes straight from Hollywood: the cliff top push, the two-wheel wipeout, and finally the Corvette barrel roll from "Wanted." The Pines family resolves to get back to normal after the Li'l Gideon incident. They throw a "Mystery Shack is Back" party, but some unwelcome guests crash the celebration. In this new Roger Corman movie, the child of Sharktopus goes toe-to-toe with the latest science experiment "Pteracuda" - half Pteradactyl, half Barracuda - in a battle for monster supremacy. Space Dandy's next adventure is "The Big Fish is Huge, Baby." If the virus doesn't get you, the water will. This week's episode is titled "One Last Time." So what's going to happen one last time before the series ends? Hopefully this week's episode probably won't be as violently brutal as last night's. Yeesh. Nora goes to New York for the second annual Departure Related Occupations and Practices conference, but discovers that someone else has her ID badge, so she searches the convention as a "Guest," and has encounters with a salesman, an author and a rogue attendee. How do you spice up life in a secret research city? Radiation shielding Tupperware parties? Frank's attempt to save his team brings serious consequences; the scientists' wives find creative ways to survive life on The Hill. This week's episode is "Batman Forever 21."